Just like the truck over all never thought a dodge truck could be so likable. The Dodge truck I own is very comfortable, I have lifter noise when I first start the engine but within a few minutes it goes away. However the truck has over 332000 miles on it. I have a rear end problem with the shims are breaking apart and in the near future will have to replace the rear end. Other than that I love the way it rides also the steering is grate very roomy inside the cab it has 4 doors. It tow's my pontoon which is a 24 foot pontoon boat like its not even their though I have a rear end problem I have to stay under 50. The front of the truck could be a lite metal instead of plastic the front looks good but it is subject to crack easily. The 4. 7 engine is great has great pick up when towing or passing on the highway is with no problem whatsoever. The front seat has an armrest that can be lifted up for more seating and has to storage areas also. The rear view mirrors on the doors are heated which at time are needed sweet. The truck itself has a very appealing look that makes me smile and happy I own the truck. I have a short bed which is 6 feet instead of 8 feet makes the truck look better however I would buy a 8 foot bead if I were to get another truck. I've replaced the fuel pump 3 times however I replaced them by myself it was very easy to do. 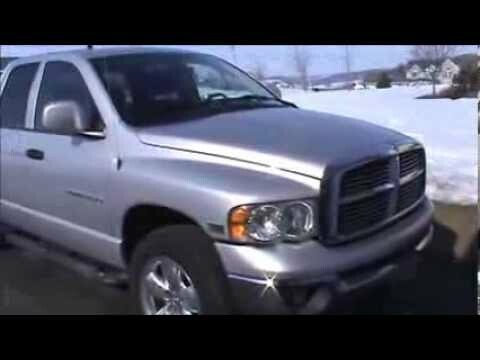 Best truck ever 2005 Dodge RAM. We bought this vehicle brand new off the showroom floor 12 years ago and it has been the best vehicle we have ever bought. We have always kept maintenance up on the vehicle and have not had any problems out of this truck at all and we are going on 255, 000 miles. I would definitely buy another Dodge RAM pickup 1500 brand new again because I know how well maintenance means to a vehicle. This truck has a Dodge hemi with lots of power and get up and go. It has the tow package so it hauls excellent without all the struggles. This has definitely been our best vehicle ever! We bought brand new and always keep everything up on it. The paint still looks magnificent, the wheels are still shiny chrome, if you didn't know you would think it was a newer model truck. I love this truck. Dodge RAM 1500 pick up truck. Dependable, works hard. My Dodge RAM 1500 is one of the most dependable p u trucks that I have ever owned, I have loaded it to overload capacity with bricks, stones, sacks of sand and cement, thought sure that I would damage the suspension for sure but the truck bounced right back after unloading and has shown to be a great both on the road and off the road, my Dodge was purchased with the tow haul package and I have pulled a pop up camper and the bed loaded with motorcycles and camping gear with no problems, truck has been very dependable, in the 14 years that I have owned it, the only things I have done is change the oil as per mfg, replaced brakes and brake rotors, and tires. If the pinion nut loosens, the rear axle may seize, and/or the driveshaft may detach resulting in a loss of vehicle control, increasing the risk of a crash. Chrysler will notify owners, and dealers will install a retention feature to the pinion nut, free of charge. The recall is expected to begin February 13, 2015. Owners may contact Chrysler customer service at 1-800-853-1403. Chrysler's number for this recall is P77.